For a completely different scene, we went to one of the hill stations in northern India in the part of India that used to be part of Tibet, 7,500 feet up the foothills of the Himalayas. Specifically, a town called Mussoorie, where the Dalai Lama first fled in 1959 when the Chinese invaded. These hill stations were founded by the British (or the Britishers as our guide in Delhi said) in the early 1800’s. George Everest lived here during the 30-40 years he spent surveying India. He and other British had vacation homes in the mountains to relax and shoot game in the forests; they built their hospitals and schools in the cooler climate. I have to admit, the weather part has been a reprieve…travelling through Delhi to get here, it was 38C. In the hills highs have been about 25C. To us, great weather for shorts and t-shirts, but locals are wandering around in down jackets and sweaters. To me. Mussoorie is really very lovely. Its main drag (the Mall), that prior to independence posted “No Indians” signs along it, is the town’s Champs Elysee, the Strand…the 5th Avenue of Mussoorie. It’s a nice place to soak in the local scene. It still has the delicate ironwork railing and Dickensian lampposts but now has a busy, tourist-oriented trade that thrives on the many who come to enjoy the cooler temperatures and experience a Himalayan India. It’s not calm and peaceful though. These tiny roads that seem an extra appendage that’s been glued to the sides of the cliffs, rather than carved into them, were made for horse and buggy, not trucks and cars. There is just no room to move and when two cars want to go opposite directions, the result is noisy, protracted, full of negotiation…and before it’s resolved, billowed into twenty to thirty cars who are stuck, unwilling to back up….and honking. How to resolve this? Indians appear to me as an optimistic lot, and this optimism seems to get them out of these messes. One driver may not back down, but then 10 bystanders on bikes, in shops, or walking by, will help negotiate a solution. There is a lot of loud discussion, but tempers don’t seem to run high and traffic tangles get resolved without anger. When our guide does get us higher, it is wonderful. Way less traffic, fewer people in the little town of Landour. We get out of the car and the breeze is rushing through the cedar and oak trees. At first, I think it’s the sound of running water… no, it’s the wind. Monkeys are in the trees. We are told leopards are common. Homes are far apart, set back into the greenery, some with bright Tibetan prayer flags flapping in the breeze. Many are retreats for writers or summer homes for families with means. They are lovely. It reminds me of walking on one of the gulf islands near my home. We spend the afternoon on foot, walking, talking, stopping to take in the majestic Himalayan range off in the distance while we each sip a milkshake. At one point we are walking home with groups of small Indian children, resplendent in the British-style school uniforms. I could definitely stay here for awhile. The food is a bit different here as well…on another day we went for a hike in the forest and our guide brought a Garhwali Thali lunch for our picnic. I had no real clear idea of what I was eating…but it was the best dahl I’ve ever had. It’s a regional cuisine to the state where Mussoorie is located, Uttarakhand. Lunch is grain and cereal based, flavourful and homemade by a friend of our guide. Supplemented with home made pickles and condiments. “Try the pickle!” says my husband. “No, I don’t want to.” “You’ll like it”. Pause. “Ok,” and I scoop up a small bit and pop it into my mouth. Chewing thoughtfully, I think I am eating a green bean. I’d seen them in other dishes. But something is not right. OMG no, this is not a bean pickle. It’s a chili and my lunch comes to a painful and abrupt end with “chili burn” that went into my ear canal like I’ve never experienced before. I was also curious about the Dali Lama having sought retreat here when his homeland was invaded. Where did he stay? Well, it turns out he stayed in what is now the nicest 5* hotel in Mussoorie. We had breakfast there one day. I need to preface this with a comment about Indian weddings. This is a huge industry and families spend a lot of money and go to a tremendous amount of trouble to put on a traditional wedding for their daughters. In our time here, we have driven by countless roadside establishments…often in small villages… that have large gated properties with locations to host ceremonies and entertain hundreds of guests. Our guide in Udaipur said that city, and many of its beautiful former palaces is a popular site for destination weddings for Indians and foreigners. So the patterns on my scarf are Sanskrit, I learned from my sister-in-law. And apparently my scarf has “come home”. A guide told me the writing was about one of the three “main” gods in the Hindu religion Shiva the destroyer…as in the destroyer of bad things. If you’re wondering, the other two are Rama (the creator) and Vishnu (the protector). There are many, many more. Every vehicle has a Ganesh (the God with the man body and elephant head) for good luck. Our erstwhile driver, Jagbir, has one permanently affixed to his dash, as do many vehicles. Or they have bits of red and gold hanging from the front grills of their truck cabs, or tied to the handlebars of their vespas. Apparently, luck is something that’s essential in navigating the roads in this county, which doesn’t surprise me one bit. The backroads of Rajasthan sometimes look like a fancy goat track. Or at least that’s what the herds of goats seem to think as we pass by… a sentiment of what are YOU doing here is held in their baleful gazes. If it’s not goats, it’s sheep, camels, school children, women carrying loads on their heads, a child’s hand her hers, the dust visibly dimming the hem of the often-gorgeous saris. Their vivid colours and patterns are stunning. One of the thing’s I’ve had to get used to here, is accepting the fact that oncoming traffic is treated like a constant game of “chicken” with a level of forced calmness. There is only room for one vehicle, but each comes barrelling head-on down towards the other, goats and people scattering, horns blaring and then at the very last minute, one of the vehicles will allow one set of his (haven’t really seen too many women at the wheel) tyres (that’s how it’s spelled here) to drop into the bumpy track. And he’s a competent driver who gets us from place to place with confidence and knowledge. But I confess that more than once I’ve been grateful for my back-row seat that doesn’t afford a view of absolutely everything. The photos I posted previously, by the way, look like “highways” to me now. And they are a smooth. Compared to the back roads, these previously scary highways create a chaotically predictable experience of weaving in and out of traffic and living beings; horn constantly on the go to say “I’m coming”. “passing on your left”, “move over”, “you can pass now”…or to pedestrians “stay on the side of the road”, or amazingly to dogs, cattle and other livestock “move over”. If we’re stuck on a narrow street in a town with buildings on each side that wasn’t ever intended for two vehicles…”I’m tired of sitting here for 5 minutes, get going!” It seems there is an entire complex language of horn honking to which I was previously uninitiated to. I’m amazed how even the sheep are trained to get out of the way. But the back roads are something else, man. And my pink scarf has shielded my eyes sometimes when I just couldn’t look at the accident that I was sure was to come…but never has. Knock on wood though…don’t want to jinx it! Or thanks to Ganesh. I don’t know. The versatile pink scarf is acquiring some new purposes on this trip. On safari to the “jungle” (which just looked too dry and sparse to allow my brain to categorize it as “jungle”) it was a bug screen. We were out there looking for tigers but our guide sadly admitted later “tigers sleeping”. 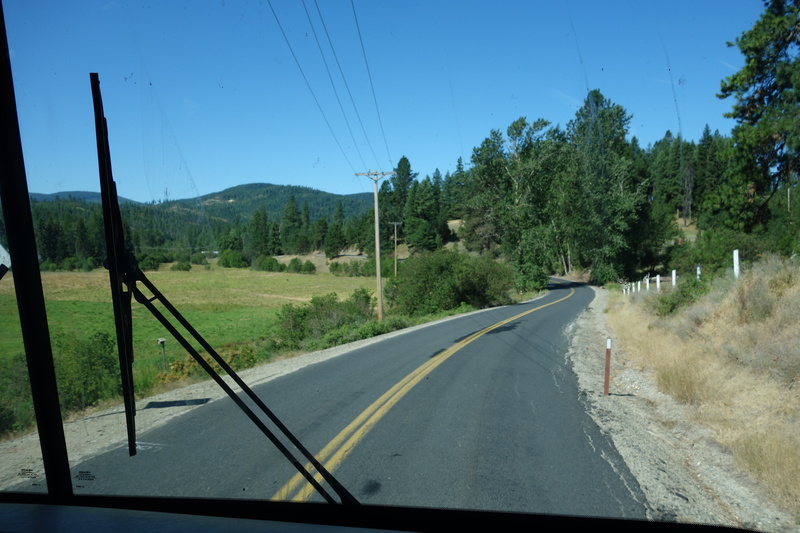 In our open-air jeep ride down the paved roads to get to the national park in the early hours, it helped keep little bugs from going where they shouldn’t. It’s been a sling for a shoulder that isn’t happy with the vagaries of travel (don’t worry Mom, I’m fine!). But mostly it’s just been plain comfort. I was looking for one like it to complete the gift cycle of its life (give one to my friend)…and in the, rather aggressive, markets in the city of old Jaipur, it was very useful as each stall hawker called out for me to see what he had to offer. All I had to do was hold up my scarf to change him to my agenda and stop the onslaught of “Ma’am! Ma’am! Come see in my shop. You buy. You like some pashmina?” and if my gaze accidentally lingered on something for just one second longer than dismissal…. “Very good quality! (not)! Yes! You look! I have others!” “Come inside!” “Sit!” But one enterprising young man wanted to take my pink scarf off someplace to see if he could find one like it. No way! I’ll never see it again! I clutched it to my chest and refused to relinquish my beloved travelling companion. So he consoled himself with a photo of it and went off to find a worthy comparison… but it seems my scarf is unique. It doesn’t help that my tolerance for browsing quickly goes downhill, so I had to leave empty-handed. I have enjoyed shopping in other places though. In one of my new favourite cities, Udaipur, we spent an hour with the CEO of an NGO called Sadhna, a collective of 700 rural women who do lovely handwork that is turned into clothing and household objects. The story she told was inspiring, It’s existed long enough to be positively impacting the third generation of these women’s families. The money earned by the grandmothers went into their own bank accounts (not into their husband’s hands). Many of them used that money to pay for their daughters to go beyond the publicly-funded grade 8 education for girls. Now those daughters are doing the same and more for their daughters, many off to university. One ran for political office (not successfully though), another opened a shop that she is going to pass down to her daughter-in-law (she says her son can go do what he wants, her daughter-in-law needs the business for her family). But to return to Udaipur, we could have spent more time there than we did, which was a grand total of one day. It’s the kind of place I could live for at least a few months. It’s pretty…lush compared to the desert-like landscape of most of Rajasthan. The title “city of lakes” is well deserved. Udaipur has a vibrant local scene with a somewhat artsy/individualistic flavour. Lots of young people who are studying beyond high school. We did a cooking class in a home here. It was run by an enterprising family where the aunt is the talent, and her 20-something nephew is the marketing, English-speaking p.r. guy. Our class was in the evening and he had a business class exam the next morning, best of luck to him. A hilly, narrow street neighborhood around an amazing Hindu temple attracted us for its variety of shops, little restaurants along the lake edge, and pretty bridges over the water…. even if I did have a scary moment on that cute bridge. I was taking a picture and turned around to see a bull with sharp-looking horns lowering his head, shaking it back and forth and advancing toward me. I speak enough “bull” to know that is not friendly and I that wouldn’t win in a horn altercation, but not enough “bull” to know what to do about it. The bridge railing was behind me and there was no place to hide. Could I wave my “Shiva” pink scarf at him, matador-style, and hope Shiva-the-destroyer would work his magic? I think not. Thankfully a passing man on a vespa grabbed the bull by its horns and physically yanked him away from me. That expression “grab the bull by the horns”…you know, the one that means “get on with it and take action”? Yah. That will forever more have a Udaipur meaning for me. Don’t stand in the road wondering what to do, with your hands starting to go up in the air…tell that bull who’s boss and get on with life! Phew. Inclusion and diversity are two words that are defining my adult life. My professional life and my personal life. I think about them when I travel. There are so many reasons people travel, but one of them is to “have a break”, or “leave it all behind”. I suppose I don’t tend to do that and I haven’t wondered much about it until now. Even before I had a family, I valued “seeing something different”. Here’s a dose of different from these various, but totally typical scenes on Rajasthan’s highways. Not side roads. Toll highways. Well, except for us in the tuk tuk…that’s a town or city thing. What does travel give us? Why do we do it? Sometimes it’s forced on us, other times we seek connection with family and friends, but sometimes it’s to experience difference. For me, difference in my life is obvious…I don’t need to travel to feel out of my comfort zone. My youngest child, in all his beauty and perfection, has FOXG1 syndrome. An incredibly rare genetic condition that he created…it wasn’t “passed down” by my husband and myself. There are only a handful of cases in Canada and worldwide, perhaps a few hundred (more than two, much less than five). And within that condition, that was first thought of like Rhett’s, my son’s is the only genetic permutation. He brings new meaning to the word “special needs”. So he’s different. And it doesn’t take strangers more than a few seconds to figure it out. I first noticed this on an extended trip to Europe six years ago and wrote about it elsewhere: https://www.theglobeandmail.com/life/facts-and…ive…children/article4549441/. So when we travel, our life back home is never far from us. My son still sees the world in his unique way, and the world reacts to him in its own unique way. As a group of four, we don’t blend in anywhere…at a fancy resort full of north americans, or the backroads of a dusty, far-flung country. And while different parts of the world react to him differently, it makes me wonder about whether, for all our politically correct talk in Canada and what our children learn in school about it, whether we truly value difference? I don’t think we do. My daughter is making me think about this right now. She’s about to “launch” from home, graduate from her high school, and consider her options. Hers is going to be the path less traveled. She’s bright enough to go away to university, and most of the cohort she grew up with is choosing that. She is choosing to be different. Going to university will, I predict, be on her terms some point in the future. But people’s reaction (admittedly also her mother’s at times) to her evolving and unusual choices is illuminating. I remind myself that thinking the same, being the same, wanting to fit in, never changed the world and never created change. And yet, we (humanity) don’t really value difference. Think how quickly “different” can veer off into “weird” or “crazy”. On the surface, we might talk a good game, but we don’t embrace it. Why? I think part of it is hard-wired into us humans…the world over. Having children has partly been a lesson in how much of my experience is determined by biology. I was talking recently with a friend who has a 15 month old daughter and I was explaining something about mothering an 18 year old. She said “it just makes me feel physically ill to think about that”. Her comment made me remember that visceral feeling of protection…I remember it exactly. If we truly valued difference on a biological level, would our species have survived this long? Personally my extreme near-nearsightedness would have done me in early in life without the invention of corrective eye-wear. On a biological level, for our ancestors long long ago, “difference” could equate to “death”. I think that hard wiring is still there. My son is a somewhat glaring example. Last spring break we were in Vietnam and Cambodia. I have never been anywhere in the world where my son was embraced by strangers as he was there. In retrospect I asked myself why. In a country like Vietnam, disability is much more a part of the cultural fabric. It’s not so “different”. I have forgotten some of the statistics, but “thanks” to Agent Orange, in Vietnam’s unusually young population (most Vietnamese were born after the war in 1975), somewhere around 20% of people have a physical disability. Strangers, instead of looking away, came up to him and tried to talk with him using his voice output program on his iPad. They asked us questions about him and what his life is like in Canada with a level of curiosity that a handful of close friends demonstrate back home. They really wanted to know him. Between him and my tall, blonde, pale-skinned daughter, I joked it was like being part of Brad Pitt and Angelina Jolie’s crew. Before they broke up, that is. On a boat ride in underground limestone caves, passing boats could be heard to say “did you see how pale her skin is?”. Daily, people asked to take their pictures with her. Everywhere she went, she created ripples of awe and staring. She found it unnerving but also kind of a compliment. As it would be for any of our pale and pretty daughters. My point is that difference is in the eye of the beholder. It’s relative. In Vietnam, my able-bodied daughter was more different than my son who, on a biological level, is completely unique in the world. But to the Vietnamese he was more Brad Pitt-ish! Here in India my daughter is different in ways she’s never dealt with before. I don’t think she’s eager to replicate the experience. Indian men follow her at attractions, surreptitiously snapping photos of her whenever she lets her guard down. Not at all like Vietnam…these men acted like they were “stealing” something from her. Our guides have angrily chased off more than one camera-snapper at most public sites we’ve visited. Our whole family was stared at in Old Delhi by every single person, almost every single minute we were there. Man, woman, young, old. Some men tried to touch her skin. It was upsetting, actually. At one point, we were standing on a street corner with our guide, waiting for our driver. I turned and faced the packed crowds on the sidewalk and saw hundreds of faces flicking over my blonde hair, and settling on the pale skin on my daughter’s legs and arms. It was quite aggressive. Men looking over the tops of their wives’ heads openly gawking. Women walking away, with their gazes back over the shoulders, toward us. I started glaring back, putting my body between the crowds and my daughter…and yes…holding up my pink scarf between my daughter and the crowds. I was ready to fight and I was taking my pink scarf with me! Being different can feel very not-ok.
My daughter employs her own version of her pink scarf to cover up her white skin. Addendum…after drafting this blog, I was accosted by a swarm of about grade 9 girls visiting Jaipur from their rural school. As you can see below, a person from Canada was a novelty. But this experience was like a compliment…they kindly asked to have their pictures taken with me…with this result! this time it was my turn to be famous. One way Canada and India are different is that for millennials, a university degree from abroad means they stay abroad. Most Canadian kids go to undergraduate school in Canada. Even if they go away for school, they tend to come back. Our guide’s only child, a son, studied in France. Now he lives in Amsterdam and doesn’t want to come back home. The younger generation in Agra, we are told, is angry. Agra’s economy is based on the Taj Mahal (translation: “Crown Palace”). 7 million tourists per year flock to the city, but pollution from nearby industry was wreaking havoc on the monument. So the government closed all industry. Now these factory workers are jobless. They don’t want to “go back” to what their parents do or did, and they’re not skilled enough for office work. Traditional means of making a living are dying out, and the old ways are dying. Here’s an example. The Taj is constructed of white marble that has been carved and inlaid with semi-precious stones. The intricacy of this work is stunning. In the right light some of the translucent stones sparkle. Many tiny pieces of stone can be required to craft one petal or one leaf. This craft is still performed only in Agra in the same way as in the 1600’s. No where else in India. But the children of these artisans are not learning from their fathers, so the skill may die with them. Things change, of course. But a craft that’s existed for 350 years, that adorns one of the world’s most famous wonders…that knowledge and skill could just vanish? It seems wrong to me. We saw the Taj on a Tuesday. The previous Saturday 100,000 people queued in lines that snaked for 2.5 hours to enter the complex. Then another 2.5 hours to enter the Taj itself. So there’s no question it holds a fascination for Indians and people the world over. The story we were told went something like this: Shah Jahan’s most favourite wife of 19 years, Mumtaz Mahal, was dying after giving birth to their 14th child. When she realized the end was near, she called her husband to her side and asked for three things. She thanked him for the love and devotion he had shown her, she asked him to look after their children, and she asked him to build her a memorial to her memory. 22 years of construction, funded off the hard work and tithes of the poor, voila. I said to our guide, as beautiful and amazing at the Taj is…when I see things like this in the world, this is the only time I am truly interested in time travel. To talk with the people who were working on the Taj. Imagine if you could ask them what they thought of it? How was the Shah received? Did they resent the taxes on their hard work paying for the construction? Or were they proud of it…did it inspire and lift them up as it does for us today? Did they feel they were part of something bigger than themselves? I am told by our guide in his 28 years of bringing people from all over the world to the Taj, that it inspires the entire range of human response. People cry. People come on their honeymoons. They come on their wedding anniversaries. This tomb for a loved wife is the ultimate expression of a husband’s love. For me, besides being in awe of the structure itself…its symmetry, its grace, how it becomes more beautiful the closer you get to it…it gave me a feeling of peace. Sometimes when famous things are turned into a tourist attraction, something is lost. In being a tourist space, it isn’t what it was before. I felt that way at the pyramids of Giza, perched at the outskirts of sprawling Cairo. Not that they aren’t amazing. They are. But like a bad actor who can’t get beyond their own persona to really show us the character their story inhabits, I didn’t see the pyramids for what they were; I saw what they were trying to be and what I was told they were. I saw them as the last suburb of Cairo with the smog, the traffic and the apartment buildings as their backdrop. I think the reason 7 million people every year aren’t wrong is because the Taj still delivers. Whether you weep, whether you linger in the gardens and just quietly take it in, or whether you think about it later. Whether you marvel at the skill that created it and the human capacity to create beauty. This wonder of the world gives you something. It doesn’t take something from you. It doesn’t try to sell you something or make you remember it. Oh but I will remember it. And I when I wrap my pink scarf around me another time, there is another special memory with it. Watching the sunrise over the Taj Mahal, check. Pink scarf making me more fashionable while doing so, check. Soft and thin. Airy. Yet warm. A shield when needed. Shade sometimes. It changes my mood. And it’s traveled the world. It can make a t shirt and pants feel more special. Occasionally it’s a pillow or a blanket. It’s one of my favourite things. What’s yours? It could be a sweater or a t shirt that has seen better days. It’s not perfect anymore. But that makes it more endearing. It has been places with you. There are memories attached. It’s comfort. That thing of yours that will eventually wear out and when you have to part with it, it will be sad. My pink scarf was a gift. I don’t know where it came from, except from the hands of a friend. So that makes it special from the start. Looking at it I know it wasn’t made in Canada. But it’s having an interesting life…for a scarf. Where is it from? Have I brought it “home” without knowing it? In countries where my gender is covered head to toe in a burka, it was a shield for my pale skin and blonde hair. It’s been a temple scarf and head covering in Egypt. In Cambodia it tried to be shade in the 40 degree heat of Angor Wat. It was a beach cover-up in Thailand. It’s been crumpled up on long plane rides. Despite the abuse heaped on it in aircraft cabins, it’s a lucky scarf…Vietnam, Mexico…Peru. In the spirit of friendship it’s been loaned to other friends for their exotic travels. Now it’s been to India. I thought about my scarf in the Ghandi Museum in New Delhi. The “new” is an important distinction. “New” means broad leafy boulevards, gracious architecture, parks and not much foot traffic. “Old” Delhi is medieval in structure…narrow streets, mayhem on the roads, smells, street hawkers, entrepreneurs, shoppers, noises…a cacophony of human experience. A place where “everything is possible” and it seems, everything is for sale. But the Ghandi Museum is quiet. A display of an extraordinary life in photos, quotes and news clippings. I see photos of him later in life. His was a life of simplicity, few belongings, nothing that wasn’t necessary. Clad in his dhoti, and leather sandals. His possessions? A walking stick and a pocket watch. Was his pocket watch a holdover from his barrister days? Or was it his “pink scarf”? Was it his favourite thing, his travelling companion? Apparently the last words he said before he was fatally shot January 30, 1948 was something to the effect of not wanting to be a minute late for prayers. This is hugely ironic in this country. NOTHING is on time. Or rather time has a different meaning. International flights are “on time”, but everything else seems to operate in a window of a couple of hours. Gervase had bought sim cards for Shannon’s and my phones that weren’t working. So he wanted to return them. It’s been two days of trying, but there are no “airtel” company offices open. A store can say it will be open at 10am, but it can still be shuttered at noon. Buses and trains can be an hour off their advertised schedule, but that is still considered “on time”. That does not mean this country is not productive. By no means. It’s a very complex place and I will not come close to doing it justice here. Here are a few things to think about though. The growth of the economy overall is outpacing that of China’s. And yet inflation is somewhere between 5 and 6 percent. We were told that the unemployment rate is 30%. India’s total population? 1.3 billion people….so more than Canada’s entire population have no jobs! 70% of the population live in rural areas. Where village homes can have no running water or septic system. Yet those with an education can do well. Companies operating on a global scale compete with reputations of offering good service at a good price. My husband’s website developer is Indian and was hired over the internet. According to our guide, Indian companies are number two in rocketing satellites into orbit (after the US). But my scarf cares about none of this. It is very busy sightseeing….no time for jet lag. Thank you Marji. 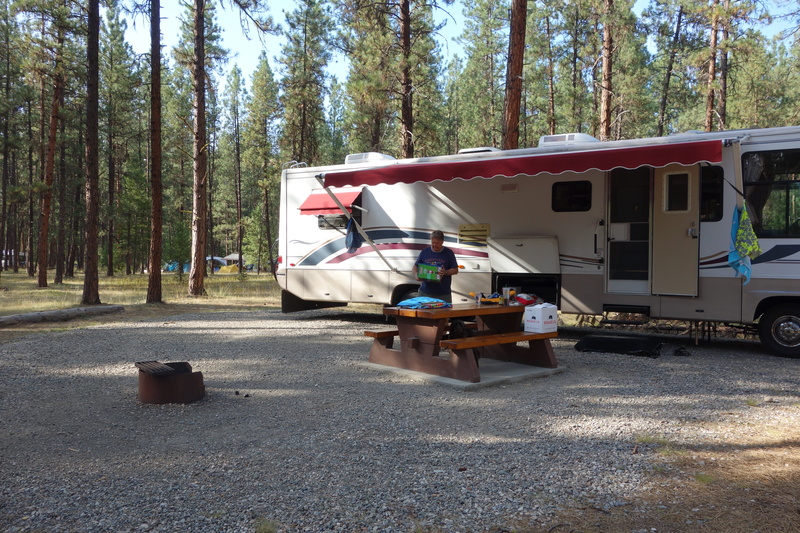 This was our last stop with the RV and it had been my good intention to write about this fabulous campground and to recommend you stop there if you were driving Highway 33 through the Kettle Valley between Highway 3 and up through to Kelowna. But our holiday memories became memories in a final sense of the word starting yesterday. British Columbia’s forest fire situation has become personal, and that campground is burning. Depending on which newsfeed you read, between 750 and 1300 hectares of forest is “aggressively” burning and 270 homes in the Rock Creek area have been evacuated. It’s hard to estimate accurately because of billowing, thick smoke. How very scary for those people. 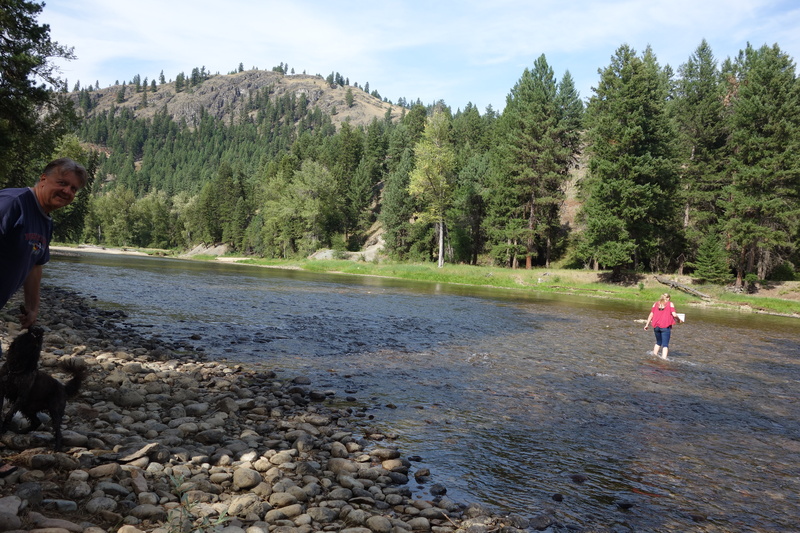 It was a beautiful campground…one of the best I’ve been to in BC. 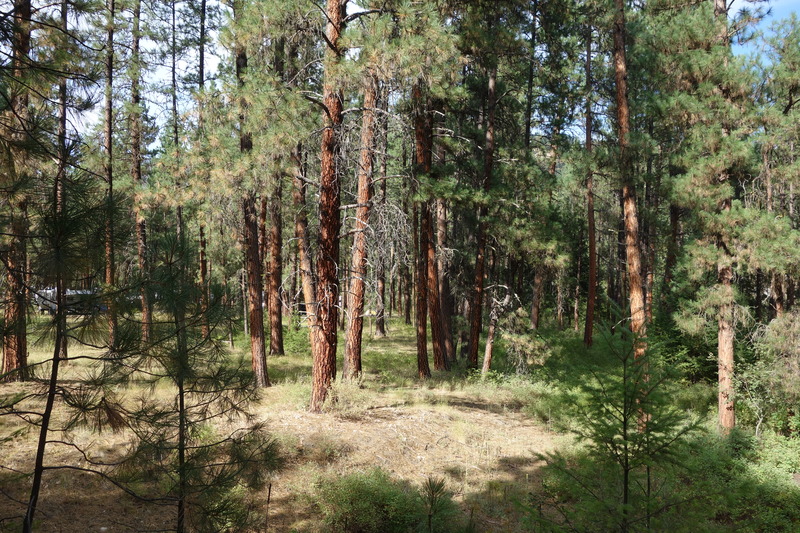 Stands of ponderosa pine with bunchgrass along the banks of the Kettle River, with the abandoned right-of-way of the historic Kettle Valley Railway running through it for walks and bike rides. 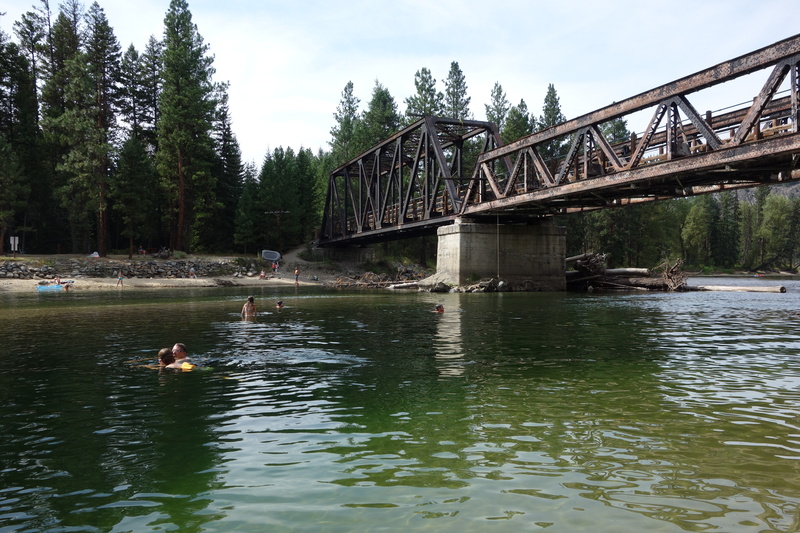 Swimmers could jump off the old trestle bridge into the river. Recreation opportunities for canoeing and inner tubing…it was fabulous. The campground was lovingly maintained. Pristine and peaceful. The bathrooms were brand new, and cleaner than clean. A playground for kids. Lots of great things for families. It was the trees that I really remember. I was just sharing with my 15 year old daughter that several of my friends had enjoyed the humour in “The Universe Has a Plan” blog post from earlier this month (thank you). “Really?” she says. “I should read it.” So she plops down at my computer to read my witty repartee. I watch her…she’s not laughing or smiling at the parts I thought she would smile (at least) at. And there it begins. I should have just left it all alone. But I can’t. Because that’s who I am. “Why aren’t you laughing?” I query at the part where I’m in my van almost 20 km from our house when I’m supposed to be in my husband’s car with the van in my husband’s possession and en route to the garage. “That’s what happens,” she says. “Well, stuff like that goes on all the time with you. Your friends think you’re this perfect, organized, calm and kind person (she now mimics perfect tearoom posture and facial expression), and they have no idea” she proclaims, while laughing at her own humour. I pretend to be greatly offended and surprised by this and with this encouragement she continues. “Shannon!” she continues loudly, grabbing my cell phone and begins poking it aggressively while laughing at how incredibly entertaining this is for her…”Shannon! My cell phone isn’t working, why won’t my texts send?…what’s wrong?” in a “demanding” voice I, ahem, might recognize.